We’ve been covering the 2D fighting game Skullgirls‘ crowdfunding for a while now, so it’s pretty hard to believe it’s over. 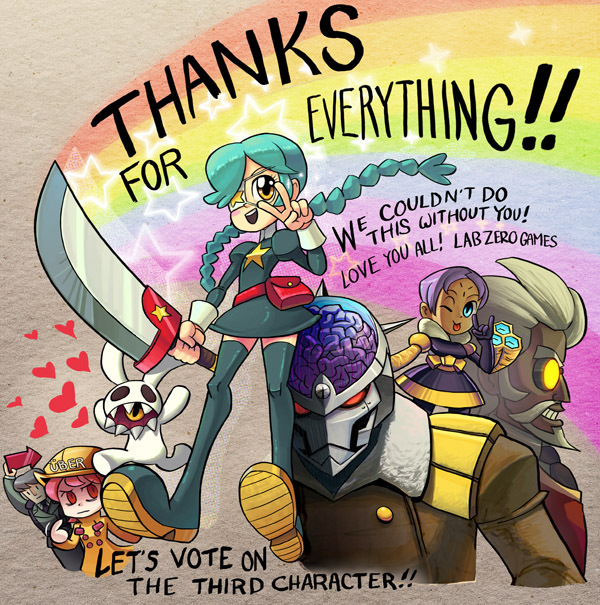 It’s been one heck of a ride, and they managed to completely wreck Indiegogo and pretty much anything related to Skullgirls (in the final minutes, Indiegogo slowed to a crawl, including DDS errors, the clock expired, but there were several thousands of dollars being processed; LabZero’s site crashed from the internet traffic). The race for the fifth character went down to the wire, finally managing funding in the FINAL minute. The final total? A mind blowing $829,829. The final stretch goal was $825,000 for the last character. Quick recap of all the benefits: there will be 5 new characters: Squiggly, Big Band, Robo Fortune and two fan selected characters. The list of potentials is on Lab Zero’s website here. Each of the first four characters will get a unique stage, along with a story mode (I kinda suspect Robo Fortune’s story and stage will go to the last fan selected character, but that’s speculation on my part and unconfirmed). There will be two other new stages to accommodate some of the reward tiers. We have a ton of voice packs, which you can see on the official Indiegogo campaign. Mane6 will get the Skullgirls Engine free of charge. The fan voting will be conducted via email, and will be available to donors only. LabZero’s site is here, and the old Indiegogo page is here. Daniel is a third year business student from Texas who got his start in JRPGs with Final Fantasy 8 and has loved them ever since. His three biggest passions are video games, technology and baseball, with anime being a growing fourth. He occasionally Let's Plays on the side as a hobby.